KV Rao sir is one of the best Faculties in Hyderabad for Java (Core Java - J2SE and Advanced Java - J2EE). Here we have collected KV Rao sir's Java Class notes which is useful for understanding the Core Java and Advanced Java concepts very clearly. KV Rao Java Class Notes is available for download here. Interested candidates can download the Java material in PDF format. If anyone has missed any classes make use of them. Also, the K V Rao Java Material helps freshers in preparing for Interviews and cracking the Java certifications. 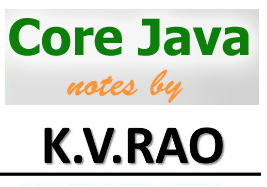 Below are the links to download the K V Rao core java notes in PDF format. KV Rao Java topics covered in the below material are related to J2SE and J2EE on the day-to-day basis. Please click on the below links to download the KV Rao Sir Java Notes and Material.